Check out Dungeon Hearts 1 on Steam! Note: Since the gameplay is completely different than Dungeon Hearts 1, this game may end up getting a subtitle or something instead of being a numbered entry. Dungeon Hearts 1 is a mashup of action/JRPG/match-3 puzzle systems, check out the link at the top for a trailer and more info if you're interested. 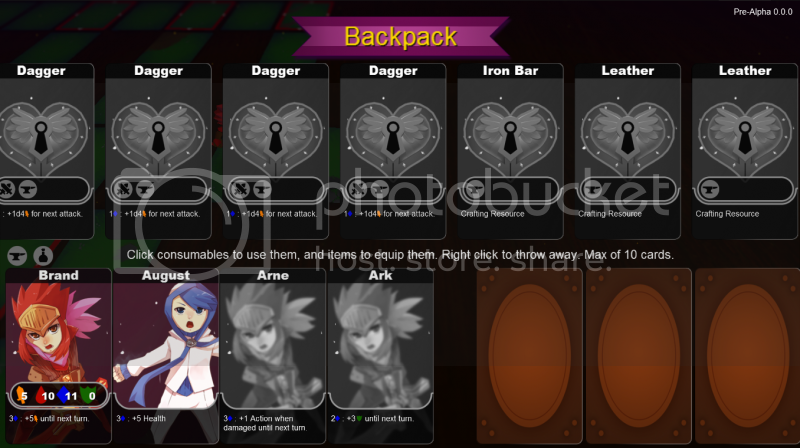 Dungeon Hearts 2 takes place in the same world with the same characters (and many more), but the gameplay is completely different. DH 2 combines the visual metaphors and gameplay of CCG's, board games, and miniature games. 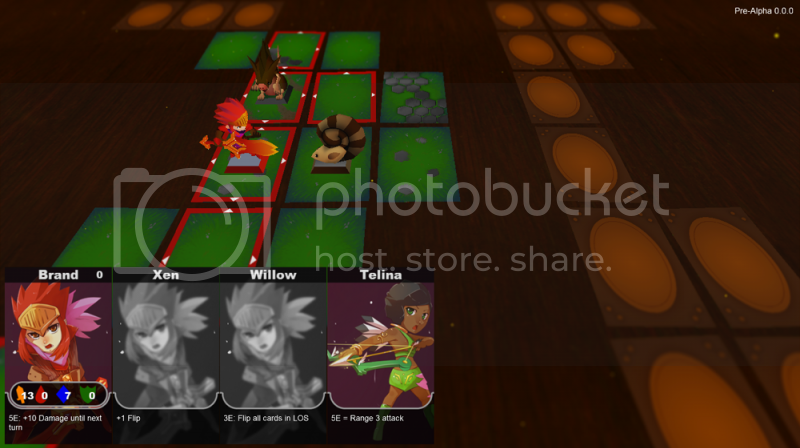 The environments are procedurally generated grids of cards that the player explores, where player and enemies are represented by D&D style miniatures. Collect cards as you explore, which can be used in battle, to upgrade your stats, or combined together to create new items. 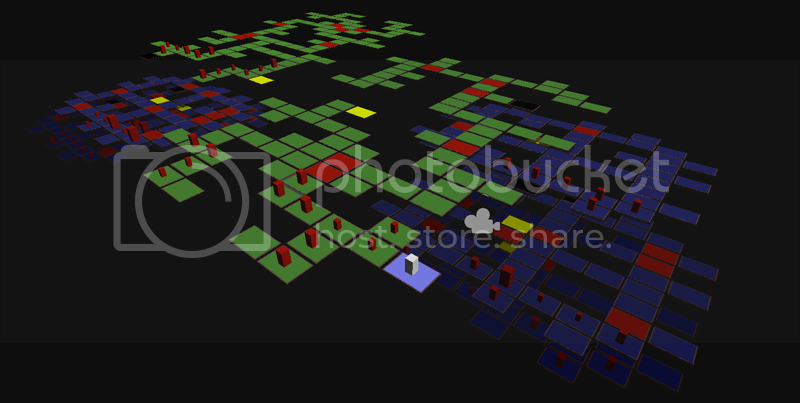 -Explore a procedurally generated, tile based dungeon, going down as far as you can. Each tile is a card that gets revealed as the player moves toward it. Each card can contain allies, enemies, items, among other things. Revealing cards is also how the player accrues Energy, an important resource in the game. -Every few levels the player can come across a Lost Soul. If the player makes it to the end of the level with the soul, he can return to the surface to resurrect the character who can then be added to the party on subsequent runs. -There are a lot of characters to find and unlock, and each comes with 1 ability that can be used during play. Which heroes you add to your party (up to 4) changes how you play since you'll rely heavily on their abilities. 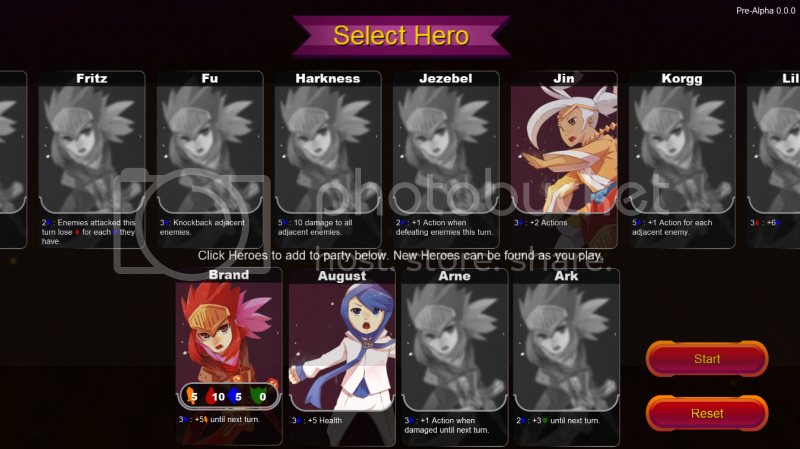 Note that once you have enough heroes unlocked, Brand (the starting hero) does not have to be in your party. 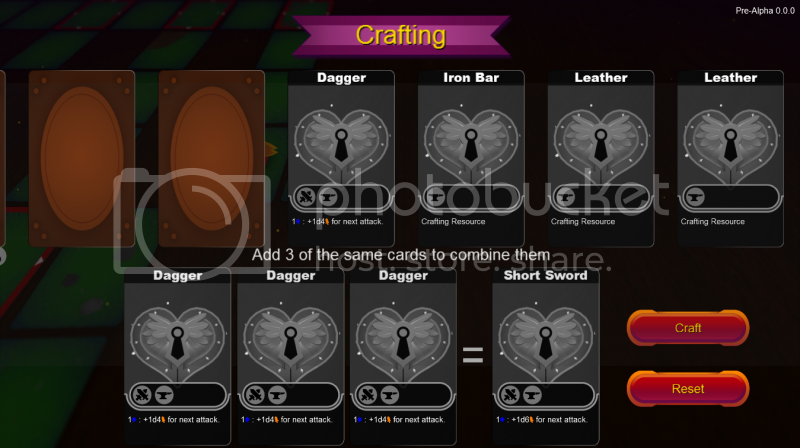 -A simple crafting system used to create items, weapons, armor, and even pets! -If you die you start over from the beginning of the dungeon, but heroes can be leveled up to provide permanent bonuses. -Other stuff that I'll type up later. Awesome! Can't wait to try this out. DH1 was great. red/brown tiles = face down (unexplored) cards. After playing a while I decided to ditch this system. Only corridors (single lines of tiles) aren't that fun to traverse, I need sections of open areas here and there so the player can more easily get surrounded and/or trapped. Also not crazy about the dimensions of the cards/tiles. I originally went with standard Tarot card dimensions, but it creates too much disparity between the width and height of maps. As I mentioned in the last post, I ended up ditching Prim's Algorithm and went with a Geomorph system. With this method, I hand-design separate chunks with exits always in the same spot along each side. Then the system places X number of chunks together based on various criteria. So sometimes you get chunks all placed adjacent to one another creating a large field that's easy to get lost in, other times they'll be placed along a path (using a Drunken Walk type system) so that one chunk only ever connects to one other chunk for creating more path-like levels. Here's a quick example. It doesn't look much different than the last pic, but you can see an open area in the center, as opposed to everything being 1 tile wide corridors. There will be a lot more open areas once I've designed more chunks. For reference, this map consists of 3 10x10 chunks connecting horizontally. Each chunk has 2 exits on each side. One of the unexpected benefits of this system is that there are lots of dead-ends along the perimeter of the map, and treasure chests are weighted heavily toward spawning in dead ends. So even though they don't get you closer to finding the exit, traveling to them is often very beneficial. Next up is adding exits so the player can traverse from level to level. I've got maps linked together now so you can travel from level to level. Here is a debug render showing several levels together. Green cards are overworld tiles and blue cards are dungeon tiles. 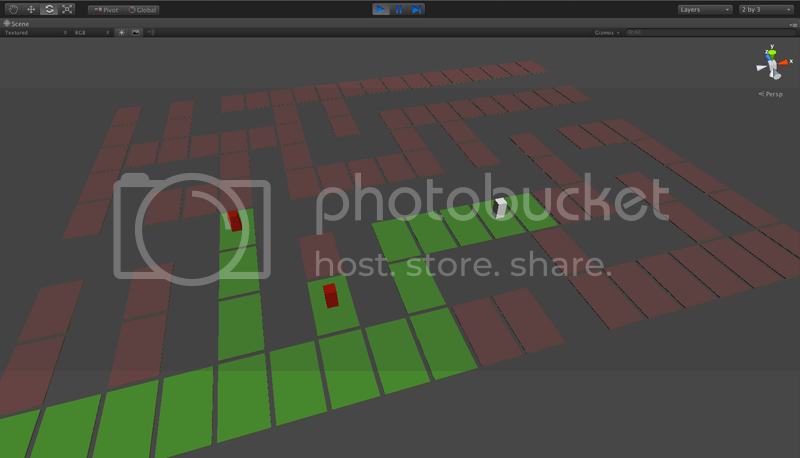 Red cubes are enemy placeholders. Red tiles are a new edition, called trap cards (cue Yu Gi Oh joke here). When the player flips over a trap card, it flips over all cards in line of sight along its N,S,E,W edges, which in turn can trigger more trap cards. Traps are weighted to spawning in open areas and intersections. Triggering traps is one of the main sources of conflict because you can take a step and suddenly be surrounded by enemies, particularly in open areas. Next up is to start adding some UI so you can see your party members and their abilities, and the stats for various enemies. Started adding some UI. Now you can see who is in your party, and their abilities. Only the leader has actual stats, as they are shared amongst the party. You can also hover over an enemy to see its stats/abilities (lower right corner). Also added some art for card backs, which you can see in the upper left area. When cards are placed, they are now skewed slightly randomly to give them a more hand-placed feel. Grey boxes near the top are the start of treasure chests, which add cards to your inventory. 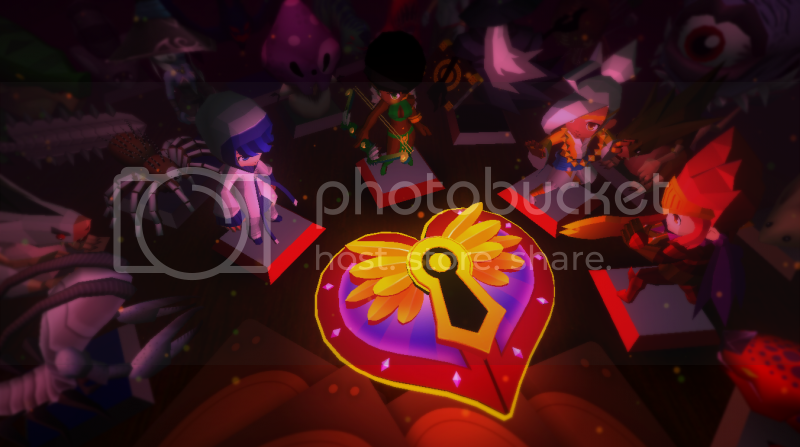 The sphere is a key that is used for unlocking gates, but since taking this I've removed them as physical items, they are now cards that can be found in chests. Ooh, I like the randomness of the cards; looks quite nice! Yeah the skewing was like 2 lines of code but it had a big impact on how the game feels. - Added a wood/table texture under the cards. 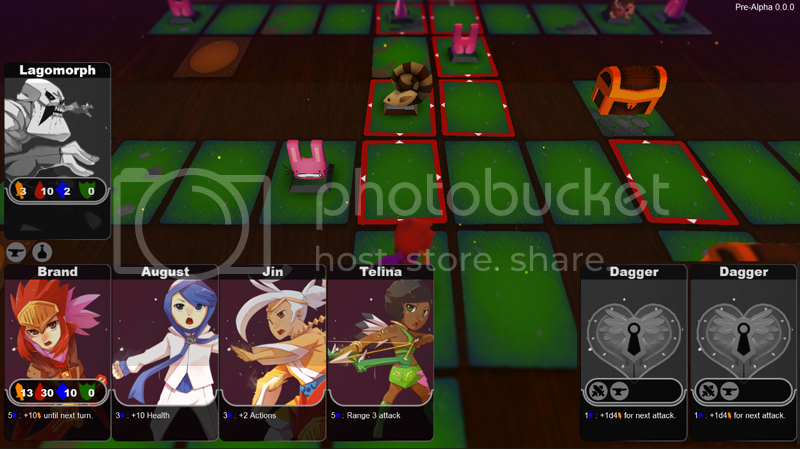 - Revamped the card layout so I could get more character art showing. - Better fonts on the cards. - A more readable stat bar for the party leader. - Took a bunch of art from DH 1 and imported into the game. 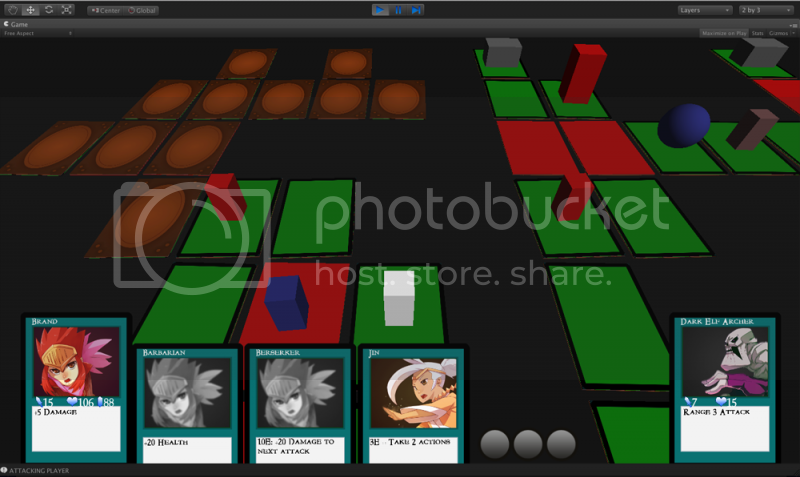 - Added card art for the overworld and dungeon biomes. - Added a subtle dust particle effect so when everything is still there is still some movement on the screen. I was thinking about adding some ambient objects placed randomly on the table around the cards like d20's and such, as long as it doesn't break the immersion. What system(s) is it on? I tried googling but Wild Card is too generic a term to find any info. Screenshot looks interesting, wouldn't mind checking it out. It's on WonderSwan, and I don't even know if the game is actually good, just heard people talking about it and thought it looked nice. It does look cool. I'd like to find out what the gameplay is, everything I found so far is in japanese. I rounded the card corners, and added more atmospheric effects such as depth of field in the fore and background (hard to tell in screenshots though). You can now equip up to 3 items, as shown in the bottom right of this shot I have 2 daggers equipped. Weapons are useful because they temporarily add to your damage, but the amount is random based on a dice roll, and the effects last only for the next attack, where as most other abilities last the whole turn. On the plus side, they are pretty cheap to use Energy wise. Same holds true for armor. Crafting is in as well (crafted those 2 daggers actually). Crafting is simple, for example I found 3 Iron Bars in chests as I was exploring, and combined them to create the Dagger. If I find/make 1 more Dagger, I could combine them to create a Short Sword, then combine 3 Short Swords to create a Long Sword, etc. Pets are created the same way. You can find various types eggs in chests, which are craftable. For example, I could combine 3 Small Spotted Eggs to create 1 Large Spotted Egg. Combine 3 of those to create a Lagomorph pet, who you can then add to your party (provided you have an open spot). Pets are the primary way of getting status-effects for your party, such as the Lagomorph who can poison enemies, or a Lamia that can stun them. You can tell what kind of pet you'll get based on the egg, so a Spotted Egg will always create a Lagomorph, Stripped Eggs will always create a Lamia, etc. Some menu screens. They'll be redesigned at some point so they aren't so busy. Grey portraits are just placeholder until characters are finalized and designed. The characters in the bottom row are your current party. I really like the possibilities the card/board theme opens up. You can have all kinds of mechanics that are much too abstract for other games. I trust the magic system will be crazy-go-nuts? A lot of it depends on your party makeup. There will be around 20 unlockable characters, and certain characters will combo together well for particular effects/strategies. For example, you normally only get 1 action per turn, but there are several characters whose abilities allow you to get extra actions in a turn. Like Jin, who gives +2 actions for a straight cost. Then there's another character who gives a free action if you defeat an enemy in a single attack. Another gives you an action for each adjacent enemy. Get these guys together in the same party and you can amass a lot of actions in a single turn, but at the cost of not having heroes will offensive or defensive abilities. Now if you defeat more than 1 enemy in a single turn, you'll start a Chain, and there are items that can be equipped that activate when you hit a certain Chain level (x3, x4, x5 Chain), whereas most other items have an Energy cost to activate. For example, while the Riposte ability is equipped, the party gains Counter Attack until next turn upon hitting an x4 Chain. Took a break from this to participate in the 7-Day FPS Game Jam, and made VALKYRIE, a game where you collect the souls of your fallen warriors and use them to cast spells on the battlefield. A few days ago I packaged up the DH2 prototype and sent it to a couple friends for some initial player feedback. Currently doing some number tuning based on that. Once I've got that more ironed-out I'll start making it available to more people. It's still pretty buggy, but playable. One of the mistakes I made with DH 1 was waiting until the end to get player feedback, so I'm starting right from the prototype stage with this one. Sent the prototype out to a handful of people several days ago, and the feedback has been rolling in. So far it's been very positive. Only 1 real (as in not a bug) issue that has come up so far, although almost everyone has mentioned it. Since you only get 1 move action per turn, it can require some dancing around to get the enemy to approach you so you can get the first hit, and sometimes you _have_ to be the one to step up and take a hit. Which can be annoying. There is no "wait" or "pass" command, which I've been trying to avoid because then you'll almost always get the first hit. There are a multitude of ways to get extra actions so you can step up and attack on the same turn, but most of these aren't available when you first start playing. You unlock new characters as you progress downward, and the schedule is fixed, so you'll always encounter the Healer first, the Mage second, etc. My current solution is to replace the first character you unlock (the Healer) with the Mage, whose ability gives you an extra action for 5 energy. Then you can get the first hit whenever you want, but there is a price. Still need more testing to see if players feel this is a good solution though. The Healer isn't necessary as the first unlock since you can find health pots in chests. Additionally, it's a while before you unlock the hero that grants Counter Attack, so I'm going to add a single use Counter Attack item for use until then. I'll be rolling out the prototype to more people over the next few weeks, then I'll probably make a web build and make it available to everyone. 2. Musicians that I've successfully worked with previously get shortcutted to the top of the list (if interested). My focus right now is purely on gameplay though, I'm not dealing with music at all until I'm out of the prototyping phase. Hope this doesn't come off as too harsh, but I wanted to set your expectations accordingly. Waiting for the demo alpha prototype anything.